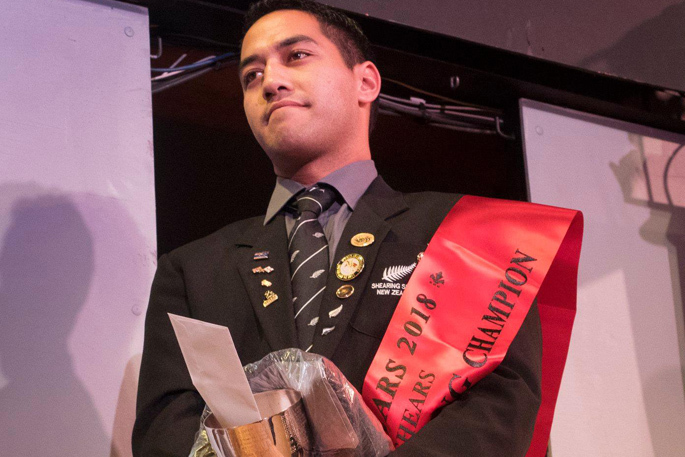 Joel Henare won the Golden Shears Open Woolhandling title in 2018. World champion woolhandler Joel Henare has signalled his retirement with a decision to step back from competitions this year, so he can spend more time with his young family. Joel felt that his boys, Keanu, 5, Hikurangi, 4, and Lee, 3), were missing out – so for 2019 he only plans to attend premier events like Golden Shears, and will no longer chase regional open titles. If selected, he will still represent New Zealand at the 2019 world championships, says Joel, who is originally from Gisborne but grew up in the woolsheds of Central Otago and now resides in Motueka. The 27-year-old has racked up more than 100 open titles in his 12-year career – only the second woolhandler to do so – and first competed when he was just 12 years old. It’s been a stellar career for Joel, who had his first open-class woolhandling win at age 15, and now holds a record of more than 100 wins, including four world titles, world championships individual and teams’ titles in 2012 and 2017, and a record six consecutive Golden Shears open titles. Joel has been around woolsheds for as long as he can remember, with mum Greta Davoren a woolhandler as well. Getting expelled from school when he was 12 turned out to be a blessing in disguise as it provided the springboard for his successful woolhandling career. He went to work in the woolsheds with his mum, and continued his education via correspondence. Joel loved the work and hasn’t looked back since those early days in the woolshed. Getting to be a world champion was the result of hard work and dedication, says Joel, who sought out the advice of master woolhandlers to “pick their brains” and organised his jobs so he could work alongside experts to see how they did things.